Drop your worries and head over to a scenic campsite for an exciting adventure of river rafting on the Ganges. Hop on to sturdy, inflatable rafts and battle the grade II and III rapids of the Ganga River for 16 kms. 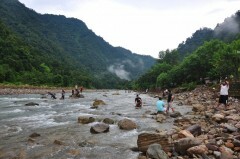 Along the way, you can jump into the river for fun activities like body surfing, cliff jumping and swimming. Back at the campsite, you can go on a short hike to a nearby waterfall or participate in outdoor games like volleyball or badminton. 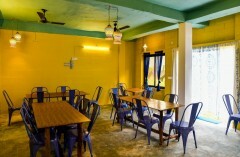 You can also sit back, relax and play chess or ludo with your friends and family. A perfect way to reconnect with nature, your campsite lies in a serene location, with refreshing greenery all around. Great for families or a group of friends, this trip is an ideal get together of adventure and leisure. Close to the gorgeous Ganga River and right next door to the Huel tributary, your campsite offers beautiful views of the mountains and forests surrounding the river. During your stay at the campsite, you will spend the night in deluxe cottages with beds, clean linens and attached washrooms. With water sports like rafting and kayaking, the Ganga River has become a popular destination for adventure enthusiasts. During your 16-km rafting stretch, you will encounter famous rapids such as the Roller Coaster, Return to Sender, Double Trouble and many more. During calmer stretches of the Ganga River, you can witness the lush green beauty of trees lined on both sides of the river and gaze up the mountains towering all around you. • Go rafting for 16 kms over the Ganga River. • Battle rapids rated grade II and III. • Participate in outdoor activities at the campsite. • Catch stunning views of Himalayan mountains from the campsite. Travellers are required to adhere to the instructions of the trip leader/tour guide during the River Rafting on the Ganges trip. Consumption of alcohol and narcotics is strictly prohibited during or before rafting. For cancellations made more than 30 days before departure of the River Rafting on the Ganges: 90% refund. 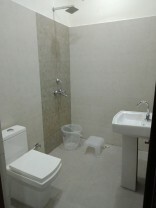 For cancellations made between 15 to 30 days before departure of the River Rafting on the Ganges: 50% refund. For cancellations made between 8 to 14 days before departure of the River Rafting on the Ganges: 25% refund. For cancellations made on or less than 7 days before departure of the River Rafting on the Ganges: 10% refund. Check-in time campsite is at 11:00 hrs and check-out time is at 10:00 hrs. Accommodation for children under the age of 6 years is not charged. 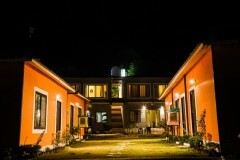 Accommodation for children between the ages of 6 to 10 years is charged at a discounted rate of INR 1,000. Accommodation for children above the age of 10 years is charged at full price. Arrive at the campsite by 11:00 hrs. 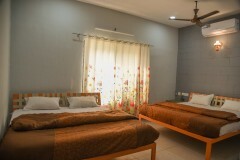 Check-in to your deluxe cottages and spend the rest of the day at leisure. Go on a short hike to a nearby waterfall and spend some time having fun at the waterfall. You can also play outdoor games such as volleyball or badminton and indoor games like chess or ludo. In the evening, gather around a bonfire and munch on some hot snacks. Overnight at the campsite in cottages. 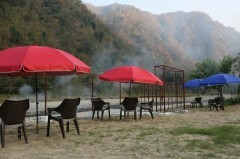 Stay at a beautiful campsite by the Huel River in Rishikesh. Day 2 of River Rafting on the Ganges: Rafting Day! Wake up at leisure and go for a morning walk to explore the campsite and its surrounding mountains. Post breakfast, check-out of the campsite by 10:00 hrs and head out for a session of rafting. You will raft for over 16 kms on the Ganga River facing rapids rated grade II and III. Feel the thrill of battling rapids with quirky names such as the Roller Coaster, Return to Sender, Double Trouble and lots more. You will also participate in body surfing, cliff jumping and swimming during the rafting session. Your rafting session will end by late afternoon. Your trip ends here. Catch stunning views of the mountains and forests. Overnight at Rishikesh campsite in cottage. 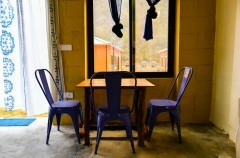 Inside views of the cottages. Today's meal package includes breakfast, which will be a buffet of aaloo parantha/poori bhaji/chola bhatura, bread toast/veg sandwich/omelette/egg bhurji/boiled egg, daliya/poha and tea. Check-out time at the campsite is 10:00 hrs. Buffet meals served at the common dining area. 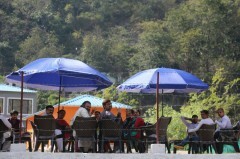 Rishikesh is well-connected to most major cities of the country via flights to Dehradun's Jolly Grant Airport. You can take local transport to reach the campsite, located 1-hr drive away.